Costs – What do you think you should be paying for tree maintenance, removal or stump removal in Fort Myers? Learn more about the average costs of each and what you shouldn’t be charged by professionals. FAQs – The tropical paradise of Fort Myers supports many species of trees, but it’s important for homeowners to be aware of which trees. They should also know which ones to avoid planting and what diseases or pests to be aware of in the area as they plant trees. Services – Find professionals in the Fort Myers area to consult and oversee on tree maintenance and removal. How Much Do Tree Services Cost in Fort Myers? With warm weather and a humid climate, many trees thrive in and around Fort Myers, Florida. Property owners, however, may still need to put in some care to maintain the trees on their own property. If you plan to bring in a professional for a job like tree removal, stump removal or pruning, this cost guide can give you a better idea of what to expect for each. How Much Does Tree Removal in Fort Myers Cost? Removing dying trees is more than just a way to improve the look of your property, because these trees pose a serious safety hazard. However, removing a tall tree on you own requires plenty of experience and equipment. A better option might be to hire a professional to tether the tree, cut it down securely, chop up the wood for firewood or haul it all off your property at once. Homeowners in Fort Myers should expect to pay between $393 and $555 for professional tree removal. Trying to get rid of a tree stump on your property can be a serious hassle, but professionals come in with commercial grinders and eat away at the stump in just minutes. In most cases, the cost is definitely worth avoiding the headache. Expect to pay around $102 to have a stump ground in Fort Myers, Florida. Even healthy trees require trimming and pruning on occasion, and proper care can help them to thrive in the humid climate of South Florida. Whether you need to prune a fruit tree or trim the branches of a palm, paying an average of $351 for professional assistance can improve the look of your property. With a humid subtropical climate, Fort Myers, Florida is a destination full of lush greenery and plant life. Even without any care, there is a good chance that your property is home to several trees that grow on their own. This guide has many of the key questions and answers to make the most of your land, follow local tree regulations and learn more about trees in Florida. What Native Trees Thrive in This Climate? 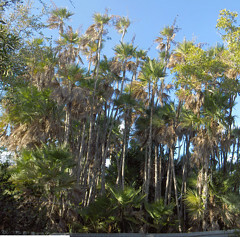 Florida’s state tree is best known as the cabbage palmetto, but it is also called the sabal palm and the sabal palmetto. Its iconic form is easily recognized, and it is even found on the Florida quarter in U.S. currency. Cabbage palmettos are found throughout the state, and they are easy to spot in Fort Myers. The Florida Urban Forestry Council manages the Champion Tree List, a compilation of the largest and tallest trees in the state. Lee County, home to Fort Myers, boasts a number of entries on the list. However, the most iconic large tree in the city is undoubtedly the incredible banyan tree that exists on Thomas Edison’s historic estate and occupies more than one acre of land. The warm temperatures, rare freezes and high humidity are the perfect combination for a number of fruit trees. 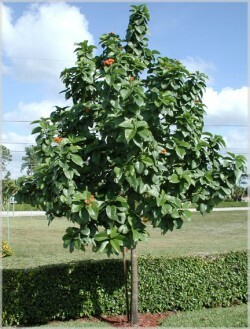 Gardeners report success with fruit trees such as mango, avocado, papaya, star fruit and lychee. What Trees Should Not Be Planted in Fort Myers? The United States Department of Agriculture has designated Fort Myers as a climate with a 9b rating. When looking for trees, you will want to avoid anything rated below 5a because these are unlikely to do well in the subtropical climate of Southwest Florida. South Florida might feel like paradise, weather-wise, but trees still have to deal with a number of insects, pests and diseases that can do serious damage over time. According to the University of Florida, some of the key things to watch for include coconut mites, palmetto weevils, laurel wilt and citrus canker. Does Fort Myers Have Any Tree Removal Regulations? Although the City of Fort Myers operates a Community Development Department and a Department of Sustainability, property owners are still free to plan to remove any trees that they choose. However, you have a duty to maintain the area in the front of your home and doing so might include trimming shrubs, branches or bushes so that they don’t encroach public roads or sidewalks. If you want to remove a tree that is partially on public land or if you and a neighbor are having a dispute about removal, you can contact Building Department for more information. If you plan to remove a tree, try to organize removal outside of the winter months. Freezing ground is unlikely, but you shouldn’t take the risk of making the process harder than it needs to be. If your property includes a right of way, an easement for electricity or is close to overhead power lines, paying attention to the recommendations of Florida Light & Power, the major energy provider in the area, is a smart idea. FPL maintains all of their power lines and trims any vegetation that may be problematic, but homeowners are responsible for the rest. Directional pruning may also occur, and in some cases, they will need to remove entire trees for safety reasons. To prevent this from happening, be sure not to plant any large trees in the pruning zone or 20 feet in any direction from an overhead power line.